UNITED NATIONS, February 19 -- Amid Sudan bombings and blockades of humanitarian aid in Darfur, the UN has done little on the ground while dodging questions in New York. 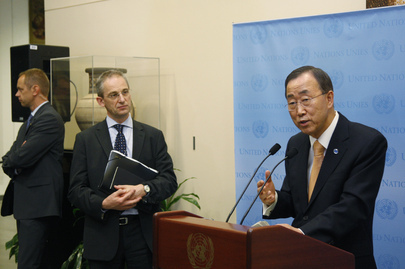 On February 18, Secretary General Ban Ki-moon's spokesman Martin Nesirky admitted to Inner City Press that peacekeepers in Darfur had not gone to the Jebel Marra villages they had heard being bombed, and had done nothing as an Internally Displaced Persons camp at Zamzam was blockaded by the government. Inner City Press: UNAMID, the UN-African Union peacekeeping mission in Darfur is quote, widely perceived sympathetic to the Government and on the whole is not trusted by Darfuris. The perception was undoubtedly made worse when the Government recently stated that UNAMID’s core job was to help the Government implement its strategy for Darfur. Can you respond? Isn’t, is it correct that UNAMID’s core strategy is to work with the Government to implement its strategy in Darfur which has been criticized as genocidal? And what is the response to this, to this, you know, to this study and to many of the questions still pending with your Office about Darfur, camp raids, et cetera? Spokesperson Nesirky: Just two points: One is that I think I’d like to take a closer look at the report that you mention. And secondly, that UNAMID works under a very clear Security Council mandate, and I would refer you to that. It explains there precisely what its role is. But as I say, I’ll need to take a closer look at the report that you mention. But Nesirky never did respond to the report. 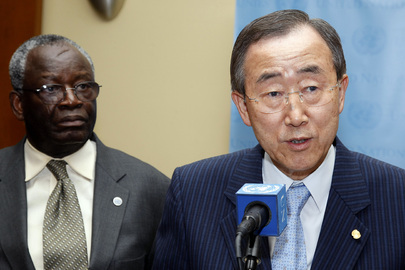 Rather, when Inner City Press asked about it again on February 16, Nesirky claimed he had answered the questions the previous day, that is in the transcript above and referred to a press conference in Khartoum by UN envoy Ibrahim Gambari, that he was belatedly adopting a “more robust” approach in Darfur as demanded (with little follow through) by the UN Security Council. Then Nesirky turned away from the questions. Inner City Press: I want to ask you some questions about Sudan. One is that the SPLM [Sudan People’s Liberation Movement] in this new fighting with General [George] Athor, he is saying that Khartoum is providing him weapons and supporting him. I wonder what UNMIS has to say about that. And also what UNAMID has to say about reports of renewed fighting in Wadi Mora, and also this expulsion of Médecins du Monde from Darfur and the allegations by the governor there that Médecins du Monde with UNAMID was delivering expired medications. Does UNAMID, you know, deny that, and what have they said about this? Spokesperson Nesirky: On the very last part, I am not aware of that particular aspect, but I know that Mr. [Ibrahim] Gambari was briefing correspondents today in Khartoum, and did address the question of the expulsion of Médecins du Monde. He said that this was most regrettable, and there is a mechanism when any NGO is facing such a dilemma that there should be some kind of negotiations between the central Government and local authorities — and that would include help from UNAMID on the ground. And this is something that I know that our humanitarian colleagues are looking at right now. Médecins du Monde has been playing a critical role in providing medical support. And they are obviously not the first NGO to find themselves in this position, and this is not something that we feel comfortable with because obviously they play an important role. Mr. Gambari did speak a little bit more about in Khartoum today. Inner City Press: And what’s your response to that report that came out yesterday among other things, saying that UNAMID is perceived as being too close to the Government? Spokesperson Nesirky: Well, I answered that yesterday, you know. UNAMID has a very clear Security Council mandate. I answered that question yesterday. Spokesperson: I am just answering on Darfur here. What I can tell you is that on some fighting that has been taking place in Shangil Tobaya, and that we are certainly concerned about that fighting, and a humanitarian assessment mission is planning to visit the area tomorrow with UNAMID military escorts. And it is our understanding that the fighting that has been talking place there since the 15th — so that is yesterday — has displaced a large number of people from the local population. And we would certainly call on all the parties to cease fire immediately and resume negotiations, not least because these clashes between Government and rebel forces and air strikes by the Government have, it would seem, led to the loss of life; losses of life, and as I say, displacement of civilians. Yes, Sylviane. Question: Sorry to interrupt, but I want to know, there is, next week, there is a Security Council on the Middle East. It seems that it is very important since the Security Council didn’t meet for the [inaudible] to discuss the Middle East. Do you know who will be briefing the Council on that matter? Spokesperson: I don’t at the moment, but I am happy to find out. Inner City Press: There are reports of Government airplanes with Antonov bombing in Wadi Mura and some other villages in Darfur. And I wanted to know whether UNAMID [African Union-United Nations Hybrid Operation in Darfur] is aware of that, if they are sending anyone out, if they have any access to the area? There are also these reports of the ZamZam IDP [internally displaced persons] camp, which I think UNAMID has some protection role, being blockaded by the Government now for two days running. Is there some… can you confirm that? Spokesperson: On the first, the bombing in the region of Shangil Tobaya and Wadimura as you mentioned, the mission is reporting that sounds of heavy explosions were heard at frequent intervals, throughout the day. And a patrol tasked to carry out investigation and verification of fighting in the area was advised by the Sudanese military at Shangil Tobaya that they should not visit Wadimura because these air operations were still going on. And the team was told that they might get clearance to allow a UNAMID patrol to visit Wadimura on 19 February — that’s tomorrow. They were trying to get that clearance from higher authorities at El Fasher if the situation comes under control. So that is what I have on that. We are fully aware, obviously, of what is going on and the need to be able to gain access to investigate and to verify what the cost is on the ground. So, that’s on the first thing. On the second one that you talked about, about the ZamZam camp; well, our understanding is that the fighting has displaced — and I mentioned this earlier in the week, I think — a large number of the local population. And this has included a large influx of IDPs into ZamZam IDP camp, as many as 1,400 families, but it is the case, regrettably, that the Government of Sudan has suspended humanitarian access, that has been since 16 February — so that is two days ago. And we mentioned that a humanitarian assessment mission was planned for that day, and we understand from UNAMID that the patrol has so far not been able to get through beyond Dar el Salaam, which is about 45 kilometres east of Shangil Tobaya, and this is because, as I mentioned, there is still activity by the Sudanese Air Force in the area. Inner City Press: Can I just ask one, because I did go and read what Ibrahim Gambari said in his press conference in Khartoum and he seemed to be announcing a new approach, in some way a response to criticism that was leveled by some Security Council members on being more active. But it seems like in both of these cases, you are saying like the Government said: “don’t go”, and so UNAMID said: “we can’t go”. Is it… How is this consistent with the new…? Spokesperson Nesirky: Well, that’s not quite what I am saying. I hear what you are saying, and Mr. Gambari has been quite clear about the need for a more robust response, not just the need, but the intention to carry through and follow through on that. I think the point here is that there is bombing going on, not to put too fine a point on it. And that would obviously make it difficult to operate on the ground there. But Mr. Gambari has indeed been quite clear on what needs to happen. And as and when I have more details on whether this, one, the verification patrol has been able to get through, and two, the humanitarian assessment mission has been able to get through, then I would happily share that with you. If the past is any guide, with many Darfur related questions pending at the Office of the Spokesperson for the Secretary General without any response, we won't be holding our breath. But we will continue asking. Watch this site. UNITED NATIONS, January 11 -- The UN Mission in Sudan transported and assisted International Criminal Court indictee Ahmed Harun, UN spokesman Martin Nesirky confirmed to Inner City Press on Tuesday, because the UN finds Harun helpful in dealing with violence in Abyei. Nesirky implied that the UN will continue to transport Harun, saying that the UN "will continue to provide necessary support to key players." Video here, from Minute 13:48. Inner City Press asked why the UN transported Harun, not only in light of his ICC indictment for war crimes in Darfur, but also of the capacities of the Sudanese Air Force, which has recently conducted bombing raids in and near Southern Sudan. If the Sudanese Air Force can bomb, Inner City Press asked, why can't it fly Harun to Abyei? Nesirky did not answer this question. Nor would he tell Inner City Press if UNMIS, led by Haile Menkerios, had checked with UN Headquarters' Office of Legal Affairs or Ban Ki-moon before transporting an indicted war criminal. It seems to some that the Sudanese government of Omar al Bashir, who has also been indicted by the ICC for genocide as well as war crimes, has no lack of capacity to transport its official Harun, but instead wanted to get the UN further involved in undercutting the war crimes indictments. Already, Haile Menkerios and his counterpart at the Mission in Darfur UNAMID Ibrahim Gambari attended the inauguration of Omar al Bashir. Inner City Press asked Nesirky, without answer, if the UN would provide transport and assistance to other ICC indictees, including Joseph Kony of the the Lord's Resistance Army, widely thought to be in South Darfur. Nesirky told Inner City Press that "Governor Harun was critical" to bringing the Miseriya tribes together. Video here, from Minute 15:58. So in this view, it is not only a matter of the fox guarding the hen house: the UN has taken to transporting the fox to the hen house. Where will there be accountability? Watch this site.